James Angerman’s New Book “A Year Devoted to Exploring Our Great United States” Is An inspiring Journey Through The Many Splendors Found In The United States of America. 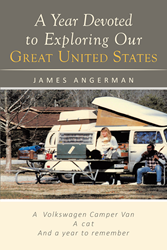 Recent release “A Year Devoted to Exploring Our Great United States” from Page Publishing author James Angerman is an inspirational story of a couple who hit the road and experienced living off the land across the United States of America. Included in this inspirational work are savory recipes that the author has tailored to fit the specific region they were exploring at that time. James Angerman, an executive chef and owner of a bed and breakfast in Oregon, has completed his new book “A Year Devoted to Exploring Our Great United States”: an inspirational and adventurous tale of traveling across the United States and taking in all the wondrous sites our great nation offers. When Jim and Katie decide to travel across the U.S. in a 1974 Volkswagen van with their ten-year-old cat Babe, they embark on a year-long journey that they will never forget. Along the way, they share delicious recipes like beer cheese soup, lobster thermidor, New York-style cheesecake, and sweet chili aioli to name a few. Angerman’s exploration of the United States with the inclusion of his regionally appropriate fare recipes, make this an enjoyable read for anyone who has ever experienced wanderlust. Published by New York City-based Page Publishing, “A Year Devoted to Exploring Our Great United States”, is sure to inspire readers to get out and experience all that this beautiful nation offers. Traveling is an experience that many seek to do abroad, however the United States touts a wide range of sights that many of us overlook. Readers who wish to experience this inspiring work can purchase“A Year Devoted to Exploring Our Great United States” at bookstores everywhere, or online at the Apple iTunes store, Amazon, Kobo, Google Play or Barnes and Noble.